Magento 2 Countdown Timer helps e-commerce stores to drive sales effectively by adding extra countdown clocks to special products or offers. It brings effectiveness for stores and enhance shopping experience significantly. 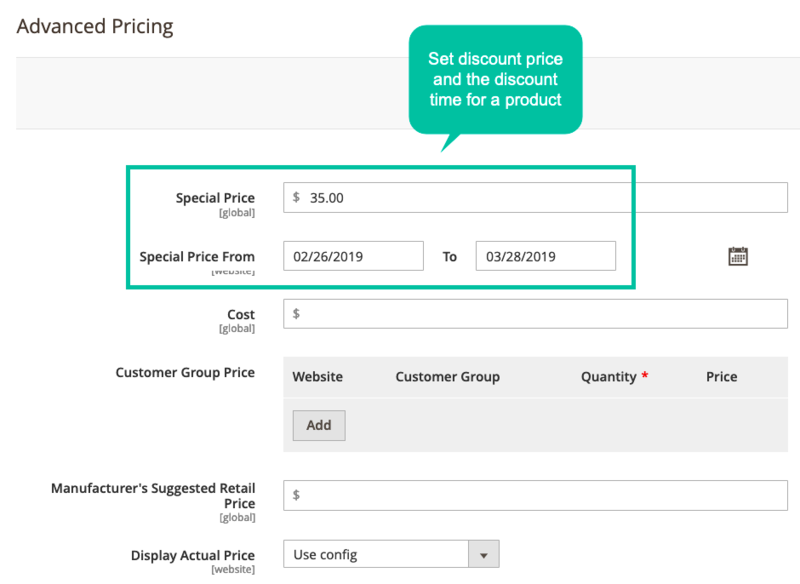 In Magento 2 Default, when a product is discounted, the way to display the prices is so simple with just two numbers of discounted price and original price. Therefore, it does not attract customers’ attention or even that they do not know they have missed the discounted products. As a consequence, the conversion rate is very low and the store’s sales campaign becomes ineffective and unsuccessful. Even customers see that there are special products on sales at the store, they do not how long the sales lasts. As a result, they would like to consider more and come back later. The final result can be that either when they come back the sales has ended or they forget totally about the sales after leaving the store site. It shows that online stores can miss the potential customers easily if they do not have the suitable solution to solve this problem. 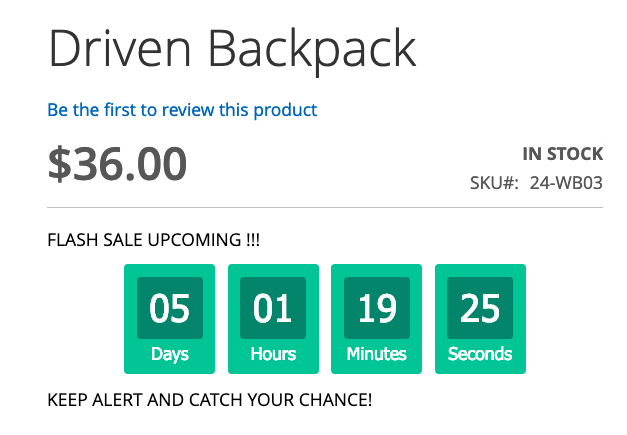 When you put a lively countdown clock on store pages or right besides the special products, customers will quickly be attracted. As a result, they will not miss the chance to get the good price or special events of the store. A countdown clock will make the sales campaign or events becomes more thrilling and exciting. The customers will feel the sales more professional and willing to take time to discover and join with excitement. Customers are likely to be more urgent and make quick purchase decision when they see that time is running out. Stores can motivate customers to make their purchases effectively by adding extra urgency in customer’s mind. Based on timer, customers can plan to buy their preferred items at the appropriate time or prepare to join special events upcoming at the store. 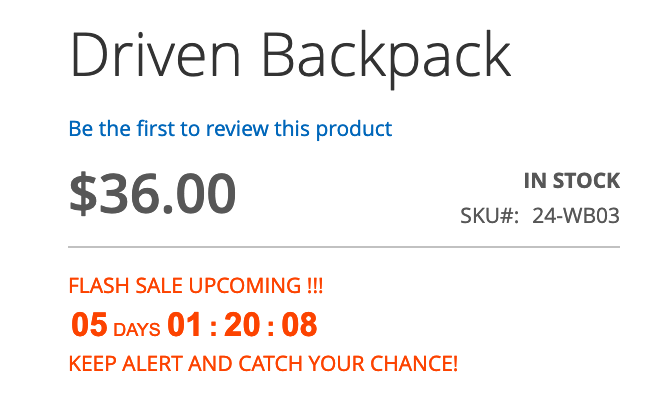 Putting a countdown timer next to specific sales product reminds the shoppers that they only have limited time. If you have a storewide sales with various appealing offers, store admins can display these countdown times for these offers right at the home page or the most visited pages to catch customers’ eyes easily. For example, 40% off for all menswear, buy all summer T-shirts with $10, and so on. 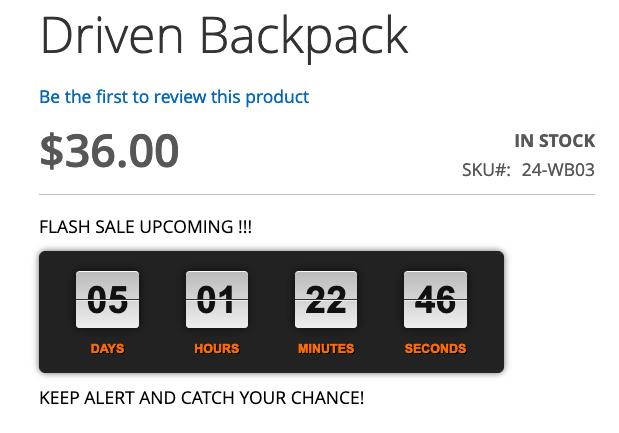 Set a countdown timer for a discount code is an effective application. Everyone loves coupons and they are likely to grab the chance to ring the discount code and make the purchase with their reward. If customers make purchase in specific time, they will get free shipping or allow using high-class shipping methods with discounts. This is the strategy Amazon has done for years, and it works. .
To make customers notice that an upcoming items/ events will be released soon, the countdown timer often be used. If customers are being concerned about specific items/ events, the information via countdown timers is really useful. To make the sales campaign more attractive to customers, Countdown Timer offers store owners two types of clock timer. They will be activated automatically based on the configured countdown time: Before Start Countdown and Time Remaining Countdown. The first type is countdown clock displaying before the sales campaign begins. In the second type, there will be the countdown clock showing the time remaining before the campaign ends. All products with special price: The countdown timers are displayed besides all the products at special price at the stores. Specific products with special price: Display the countdown clocks besides specific items which are applied particular conditions. 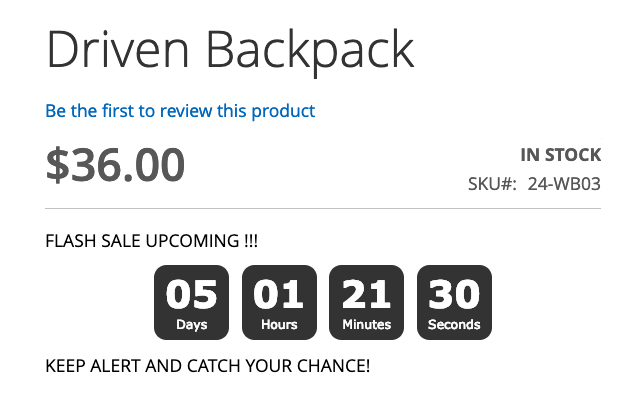 For example, the items with special prices at Men Category and with black color will be applied Countdown Timer. 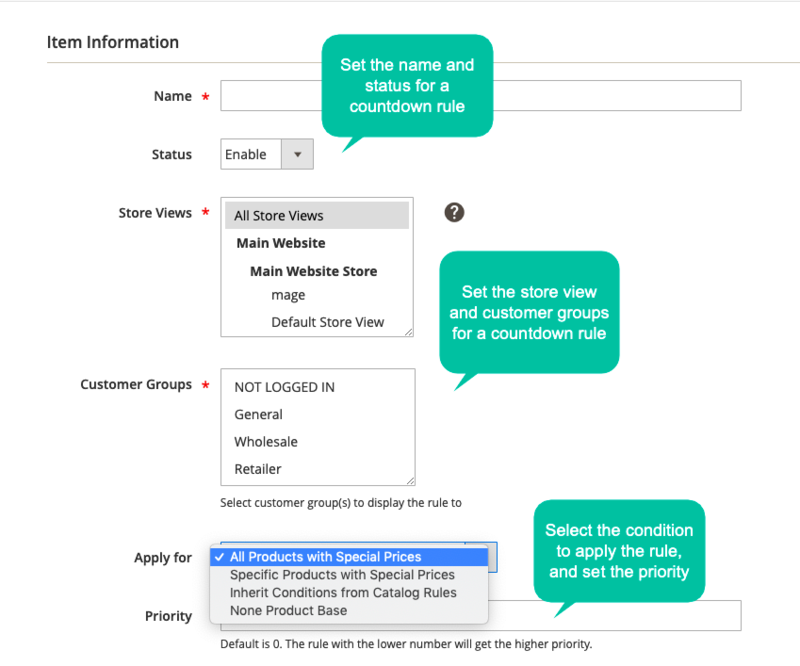 Inherit conditions from catalog rules: The products which belongs to specific catalog price rules will be applied with countdown timers. 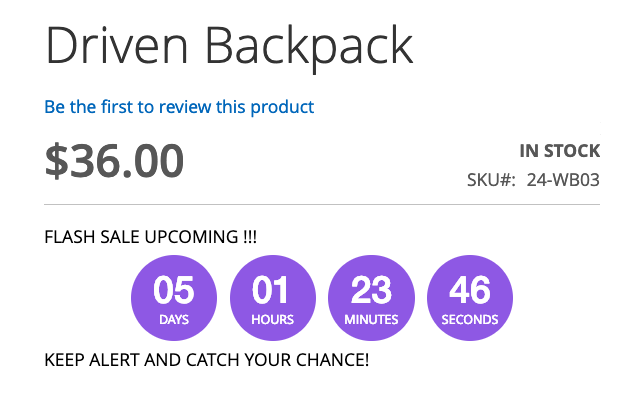 None Product Base: The countdown clock will be applied without depending on the special price product. This type of condition is often used in occasions such as coming-soon items, or upcoming events at the store. 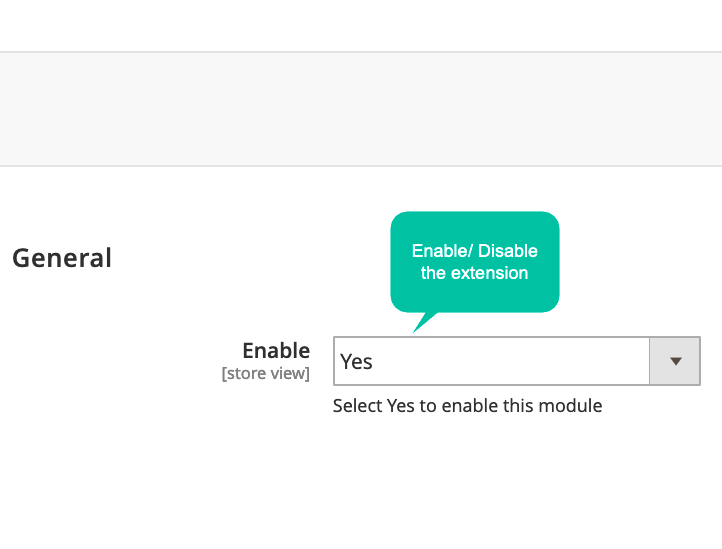 Store admins can freely select the favourite clock styles with 5 ready-to-use clock samples offered by Mageplaza Countdown Timer for Magento 2. Each style with the speciality in color, shape, and other elements allows stores owners to match with store themes easily. Besides, these available styles can be customized to meet exactly the store owners’ expectations. One of the most noticeable feature of Mageplaza Countdown Timer for Magento 2 is setting schedule for countdown clock. In case the sales is not based on the product price, there is particular schedule configuration section to set start date and end date for the clock in the backend. Besides, with the cases with special products, the clock will be limited to run in the specific time according to the discount time of the products. 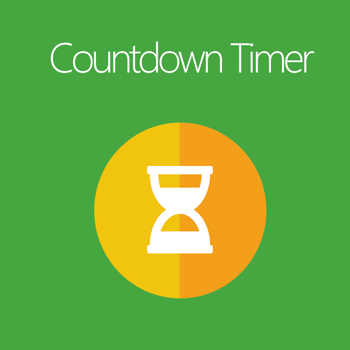 Countdown Timer Widget is supported so admins can select places to add at store pages. Snippet allows store admins to display the countdown anywhere quickly. View, edit all the countdown timer rules via the Countdown Timer grid. Set the priority for the rules to be applied with easy. Set the name for a new rule Store admins can easily put any appealing labels for each new countdown rule with the aim to attract customers attention. Enable/ Disable the rule From the admin backend, admins can allow/ disallow the countdown rule by clicking enable/ disable Countdown Timer options. Select the store views Thanks to Countdown Timer, admins can choose the suitable store view for a countdown rule. 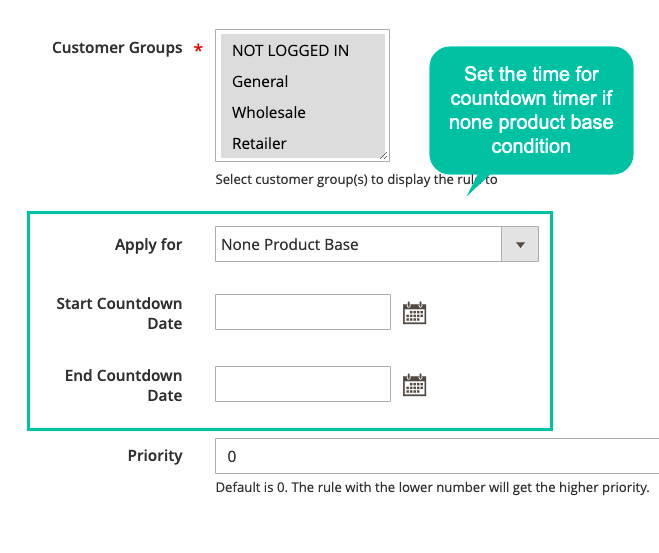 Select the customer groups to apply the countdown rule It is able for store owners to apply the rule for particular customers groups including NOT lOGGED IN, General, Wholesale, Retailer. Select the types of conditions to apply the rule There are various cases in which countdown clocks will be run including All products with special price, Specific products with special price, Inherit conditions from catalog rules and None Product Base. 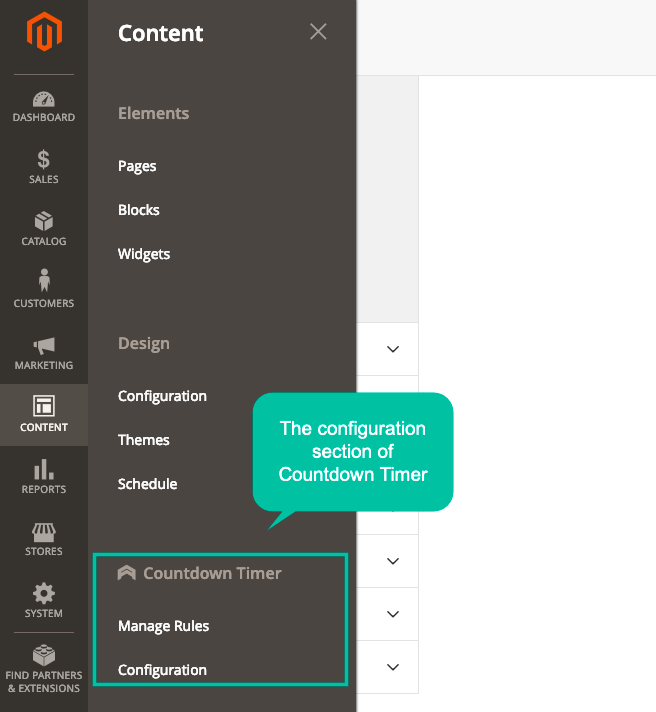 Set the priority for the rule With the support of Countdown Timer extension, store admins can easily set the priority for the rules to be applied. Enable/ Disable Before Start Countdown To show countdown clock before the sales campaign starts, store admin can active Before Staring Countdown timer. In case, admin, want to disallow it, they can easily click Enable from the admin backend. Enable/ Disable Before Start Countdown Countdown Timer offers 5 available clock stypes so it is convenient for the stores to choose the appropriate styles. Enable/ Disable Time Remaining Countdown If the store admins want to show the time remaining before the campaign ends, they can choose Time Remaining Countdown timer. Select clock type for Time Remaining Countdown There are 5 ready-to-use clock styles which store owners can choose to use instantly. Customize the clock styles by Custom CSS Admins can easily make changes in the clock styles with the support of custom CSS. 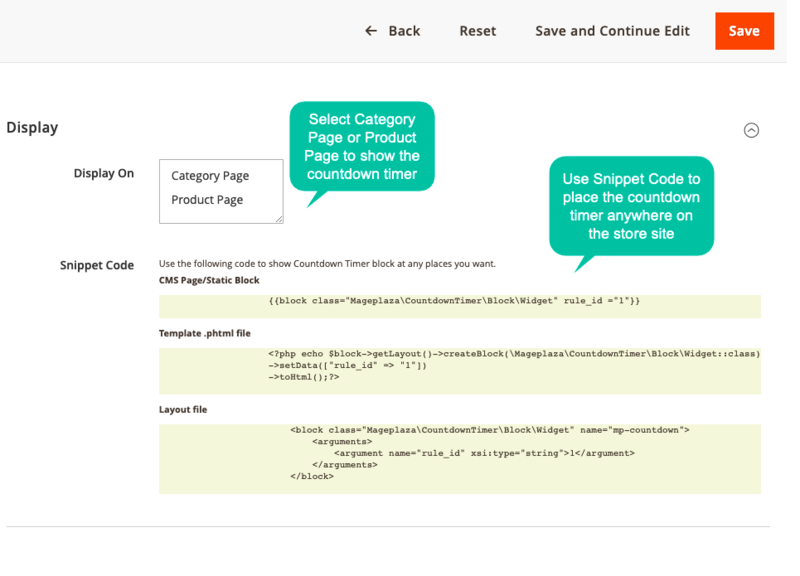 Select to display the countdown clock on Category Page or Product Page From the admin backend, store admins can select Category Page or Product Page to display the countdown timer. Use widget or snippet to display the countdown clock at any position on store site Widget and Snippet allow store admins to show Countdown Timer block any places they want. Easy to notice about special offers at stores Customers can easily be attracted by a lively countdown clock on store pages or right beside the special products, so they can keep an eye on special offers of stores. Have better shopping experience on store site It is likely that the customers will feel more satisfied and happy during the shopping journey because they will not miss the chance to get a good price or special events of the store. 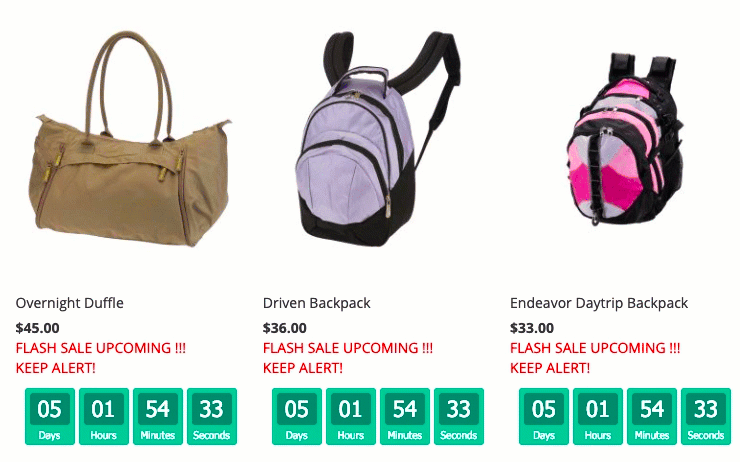 filter_drama Can I use a countdown clock for upcoming products at my store? Yes, you can do it easily by enabling Before Start Countdown. The clock will show the time before the products have been released. filter_drama Can I add any title to the countdown timers as I want? Yes, there are title and custom CSS sections so you can add any titles for your campaigns as you wish. filter_drama Are there any available clock styles to choose? Yes, Magento 2 Countdown Timer by Mageplaza offers 5 ready-to-use clock styles so that store owners can select to use instantly. Besides, these are customizable clocks so admins can make changes with ease via custom CSS. filter_drama If I would like to apply countdown for all discount product, which condition should I choose? You should select All products with special price at the Apply For section in the admin backend. filter_drama How can I apply the countdown for specific products? At the admin configuration section, firstly select Specific products with special price at the Apply For section. Secondly, at the Condition tab, please add the conditions to sort out the specific products. filter_drama I already create some Catalog Price Rules. Can I activate the countdown timer based on it? Yes, definitely. Firstly, go to select Specific products with special price at the Apply For section. Secondly, please select the Catalog Price Rules from the available drop-down list.